Chilli Garlic chutney | Garlic Chutney is a spicy red chutney which is generally served with idli dosa or even with paniyaram. I have shared earlier this chutney and get many requests to post the recipe mainly due to its colour. Apart from looks the chutney tastes delicious with South Indian breakfasts. I love the garlic flavour in this chutney. I have added lots of garlic to get the nice aroma of garlic. It is a spicy garlicky chutney with full of flavours. This is simple to make delicious dip or spread for breakfast. You could spread on top of dosa to make Chilli Garlic Dosa. You could even fill with Potato masala and serve like Mysore masala dosa. You could even use it as a seasoning for any salads. In a blender jar add the soaked red chillies, garlic, tamarind, salt and blend well to make a coarse paste without adding any water. Now add some water to grind well to make a smooth paste as much you can. Heat oil in a pan and add mustard seeds if you like once it crackles add the ground chutney and mix well. Allow to cook the chutney in low flame till the oil separates on top. You could use this chutney for a week under refrigeration. Note: Replace some red chillies with Kashmiri red chillies to make the chutney less spicy. Or you could add one tomato while grinding to reduce the heat from chillies. Adding enough oil is important for this recipe. 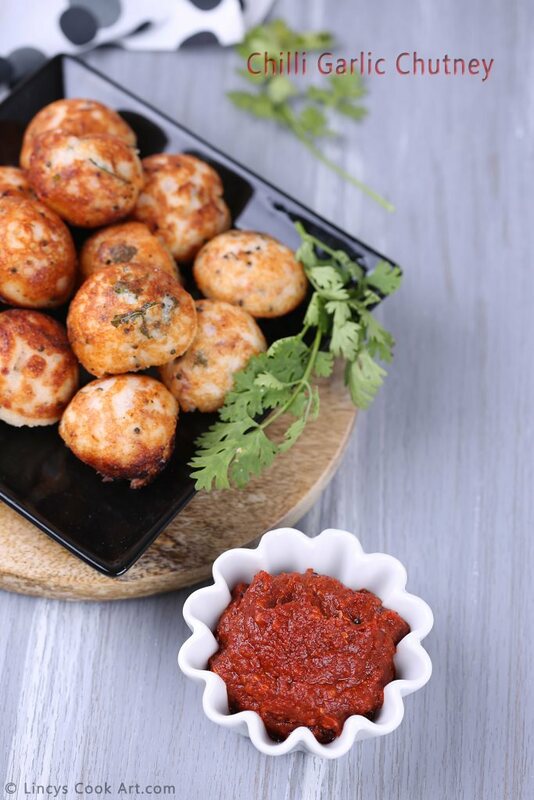 Paniyaram and chilli garlic chutney - awesome combo.. looks tempting..